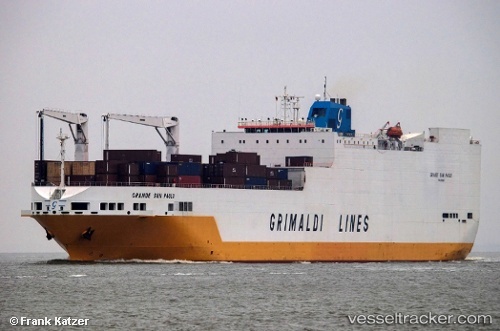 During offloading operations at the Valongo Container Terminal in Santos struck aboard the "Grande San Paolo" got out of control in the morning of April 8, 2019. It ended up as a runaway and caught fire when coming to a standstill in a final crash. The crew could extinguish the fire, damage to the ship thus remained limited. It had come from Zarate and remained stationary in port on April 10. Grimaldi Line has offered a multi-million pound contract to A & P Shipyard in Falmouth, in the light of stiff competition from all over Europe. The job involves constructing four huge rudders, weighing 42 tonnes each, for their multipurpose vessels - GRANDE SAN PAOLO, GRANDE BUENOS AIRES, GRANDE FRANCIA and GRANDE NIGERIA. The first of them will arrive in Falmouth in late April for a full survey, maintenance work, and new rudder installation. The three remaining units will follow over the summer period. This contract cements a relationship lasting 10 years, taking the total number of Grimaldi ships repaired by the A & P Group to 50, most of them in Falmouth.